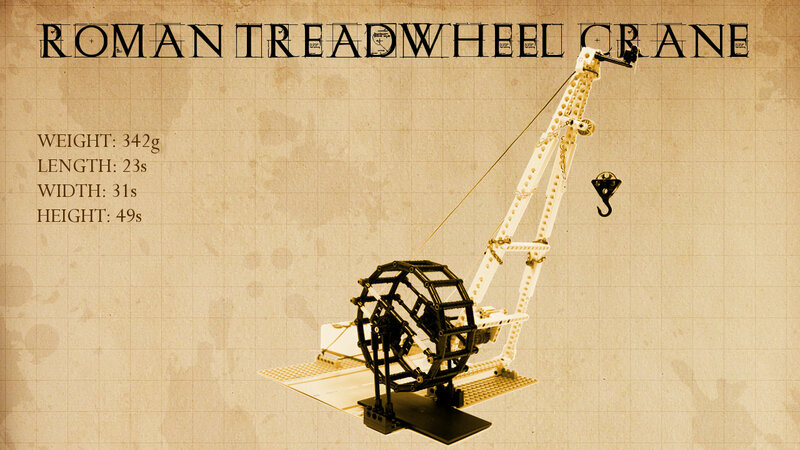 Model of an ancient Roman treadwheel crane. 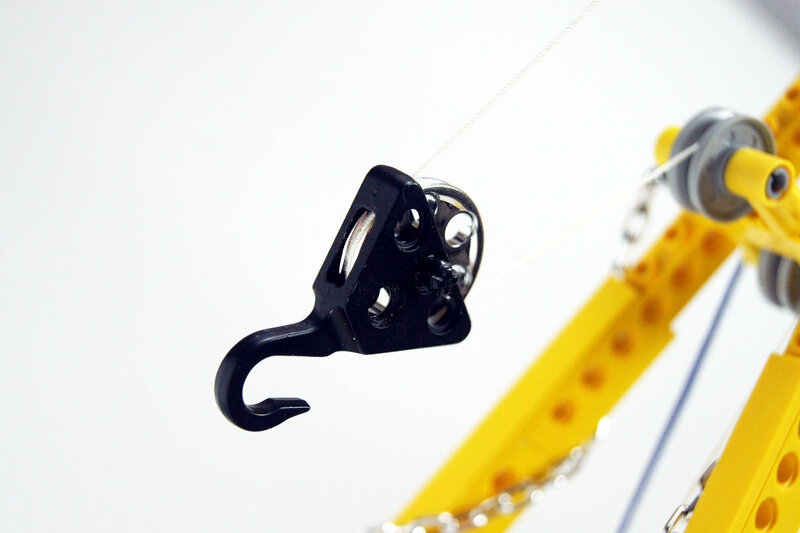 Features a winch with a gearbox and two safety ratchets. 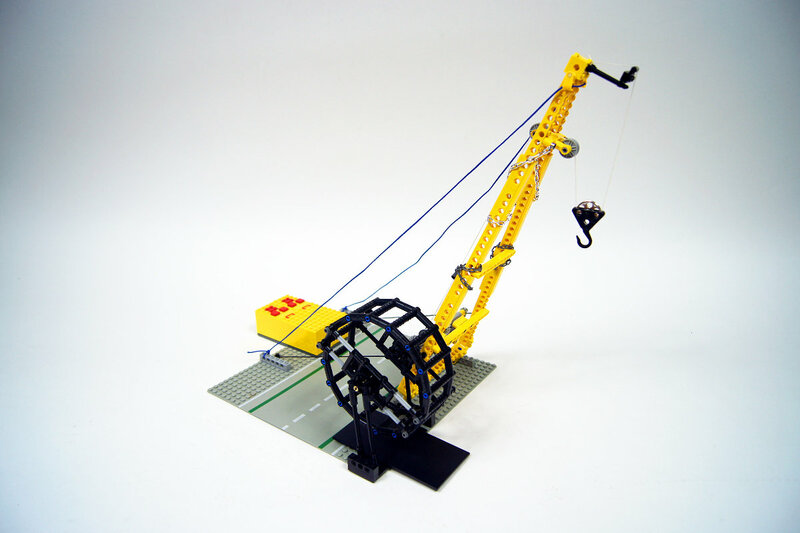 I was recently asked to write a post about cranes for the official LEGO Technic blog, and the subject eventually came down to the history of cranes. 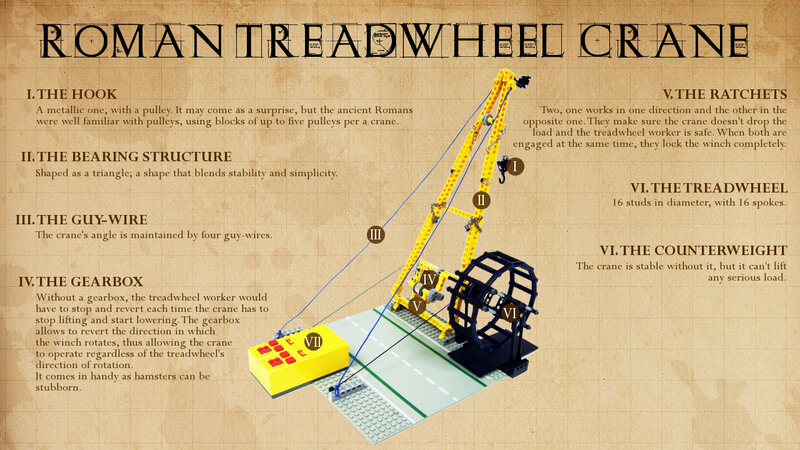 This is how I came across a very interesting construction: the treadwheel crane invented by ancient Romans. 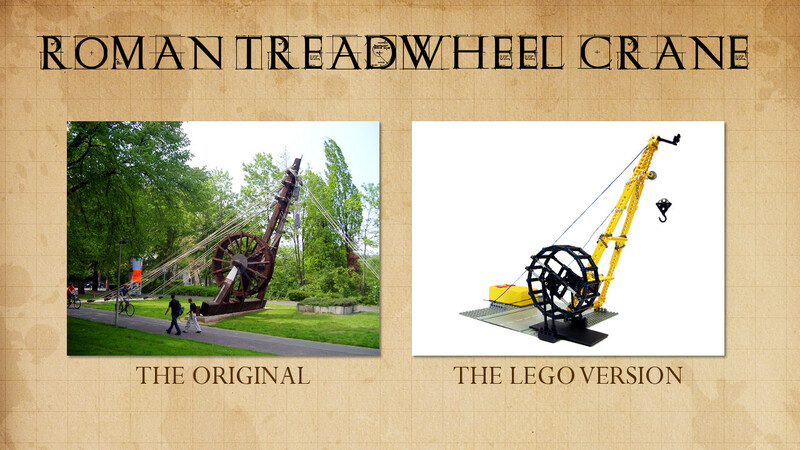 It may appear primitive, but it introduced the treadwheel, which offers greater mechanical advantage than a crank, and it used multiple pulleys. 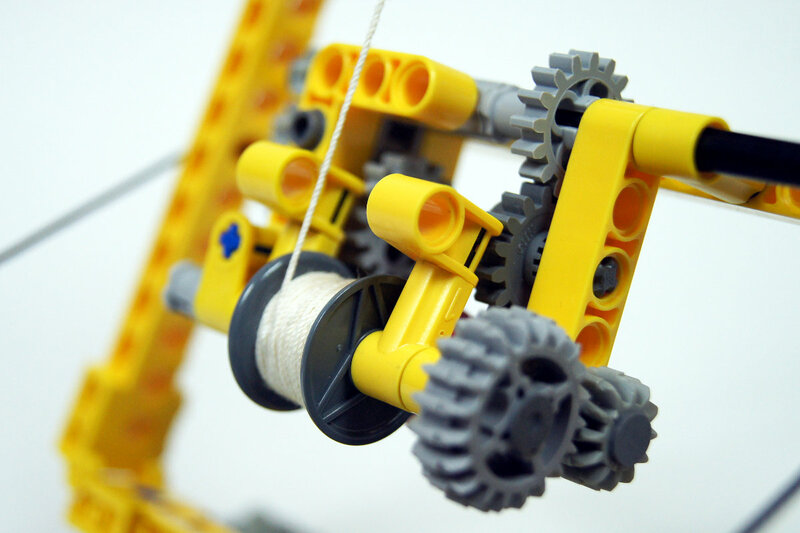 The Romans were surprisingly well versed in the use of multiple pulleys, using blocks that combined up to five of them for a single crane. Together with the treadwheel, it made the most advanced Roman cranes able to lift up to 3,000 kg of load while operated by a single person. It’s quite an achievement for a simple construction of wood, string and few pieces of iron. 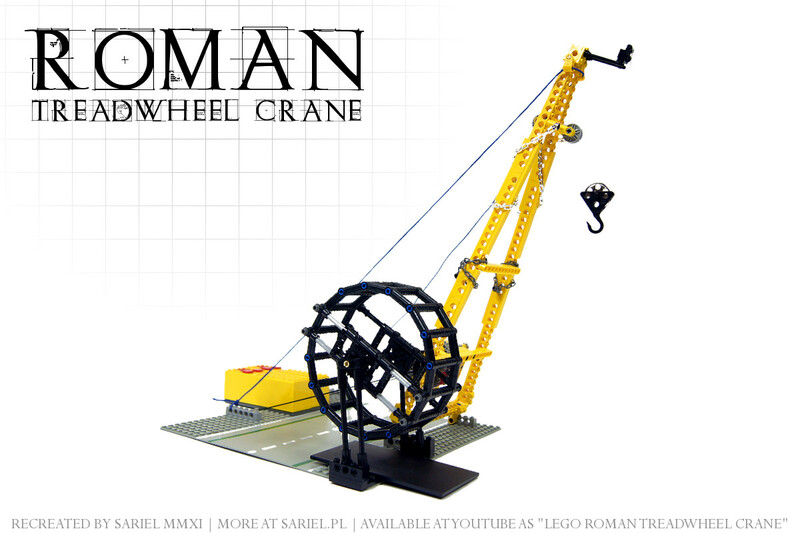 Moreover, we know that Romans operated loads beyond the capacity of any single crane of the time, which means that they were using several cranes together to lift a single load, which required a great deal of co-operation between the workers. 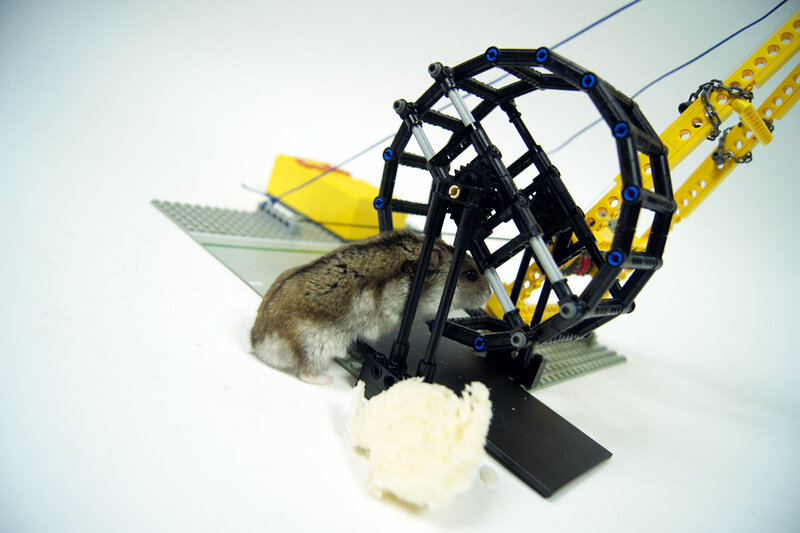 The model was intended to be driven by hamsters, which made it more complex that I initially planned. 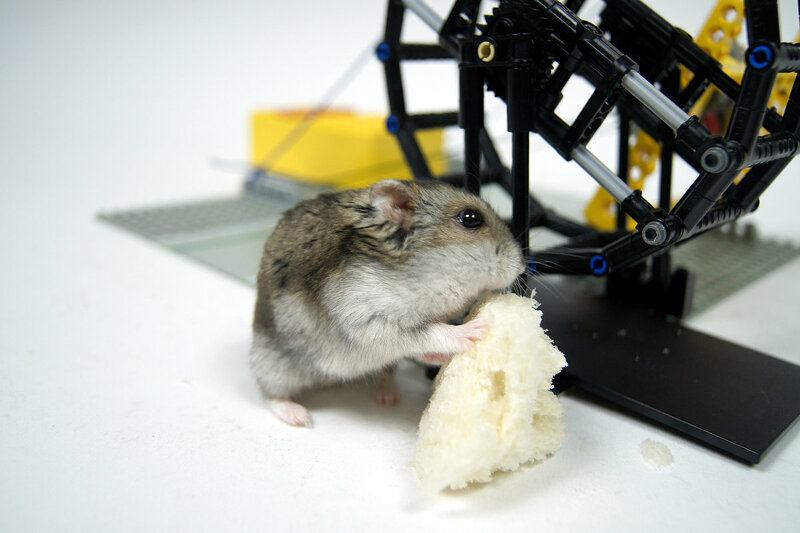 Since hamsters are unlikely to stop and turn around when ordered to, a mechanism that would let operate the winch in both directions (lifting/lowering) independently of the treadwheel’s direction of rotation was required. 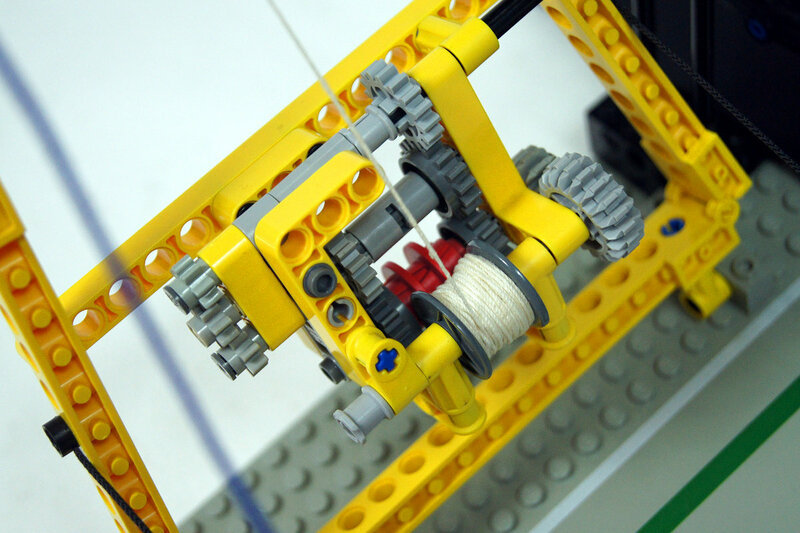 I used a simple gearbox, very similar to the one used in my RC motor output selector, which allowed to change the direction of the winch with a single switch of the transmission ring. To prevent the crane from dropping the load if a hamster stops or quits the treadwheel, I have also added two simple ratchets in the gearbox. 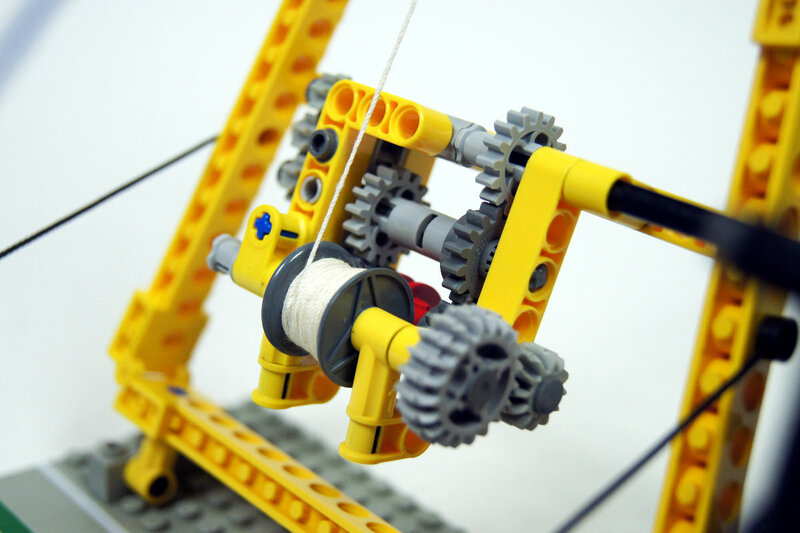 They work in a typical way: when engaged with a gear, they let it rotate in one direction but block it when it rotates in another. A single ratchet is usually sufficient, but here it took two because the ratchets engage gear in the gearbox, which can rotate in one direction or another while lifting, depending on the driving ring’s position. 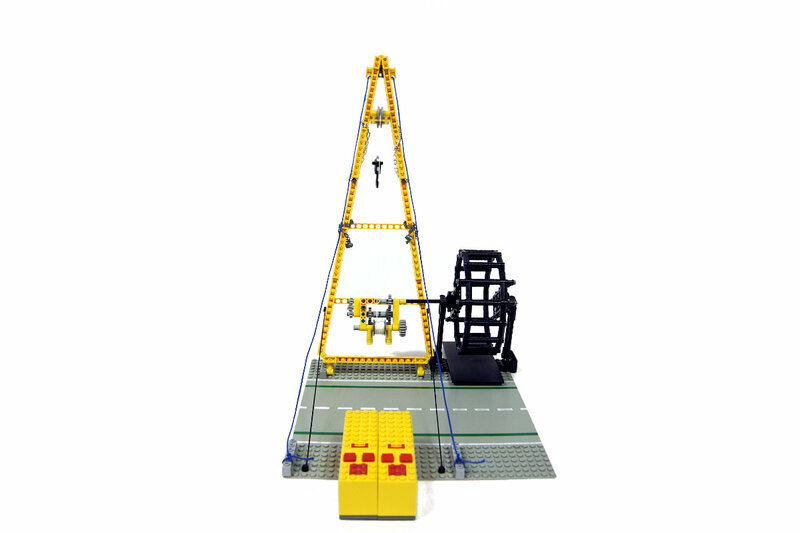 The crane’s position is maintained by four guy-wires attached to a baseplate. 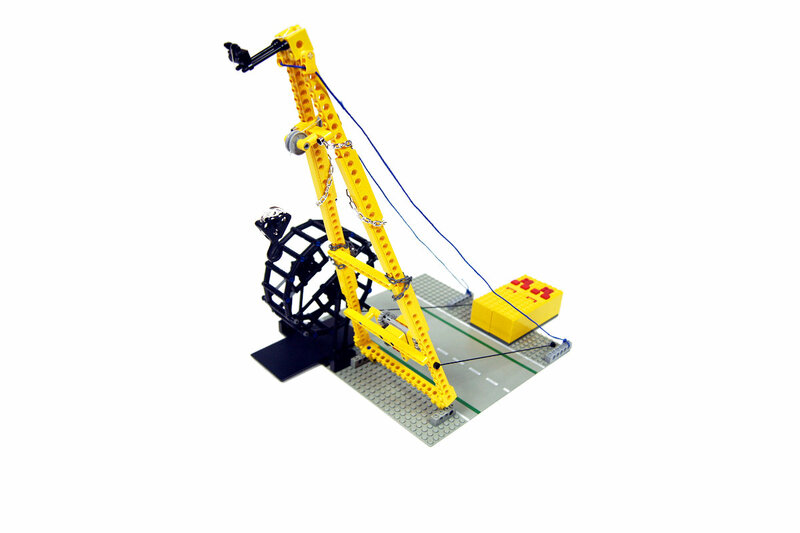 The baseplate alone is enough to make the crane stand, but in order to lift any serious load, a counterweight is needed – hence the two yellow battery boxes. What I missed in my design was the organic factor: the hamsters. 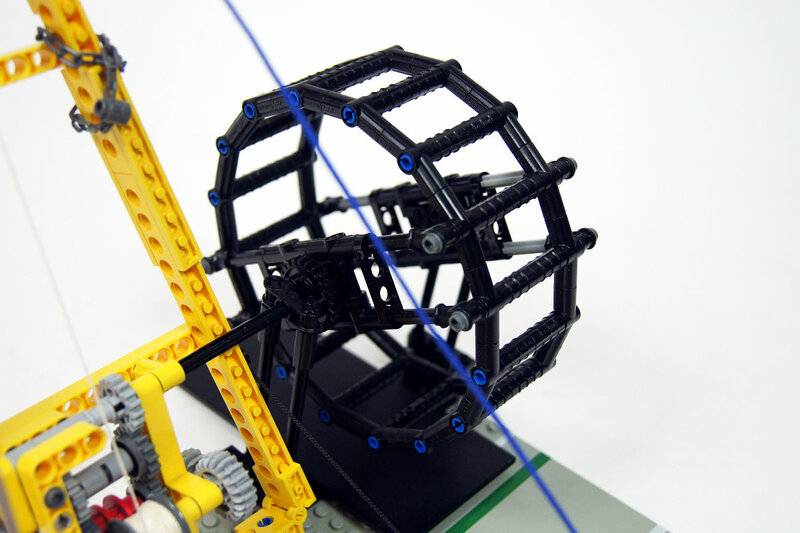 They all have treadwheels in their cages and use them enthusiastically, but they were not interested in a Lego treadwheel, not even slightly. Worse – while I expected them to be an obedient labour force, they turned out to be the destruction incarnate in small, furry 4-legged packages. I was eventually forced to give up and to resort to the use of electricity. 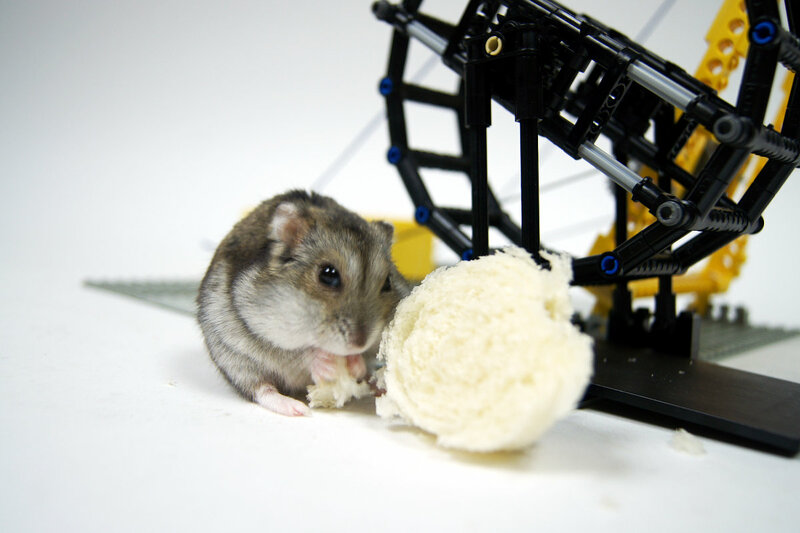 I suppose the hamsters simply didn’t like the spokes in the treadwheel, or perhaps it was too hard for them to make it rotate. 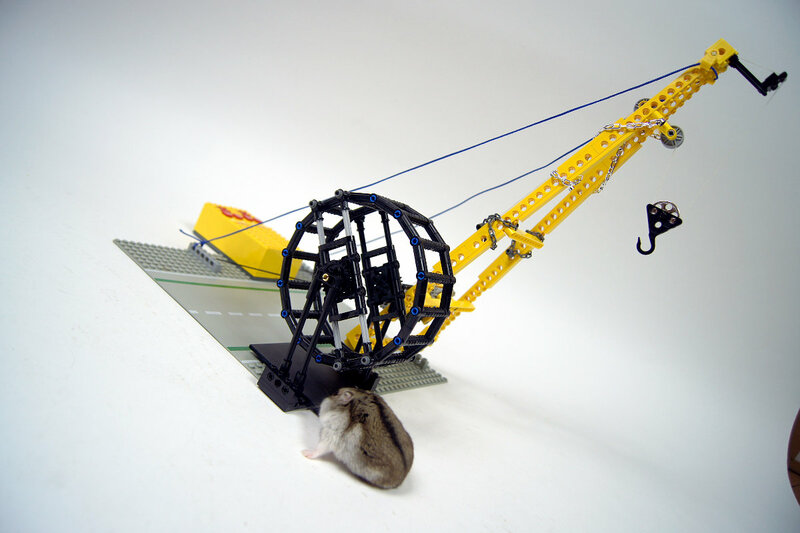 Efficiency of a treadwheel depends largely on the weight of its operator, and dwarf hamsters rarely exceed the weight of 60 grams. 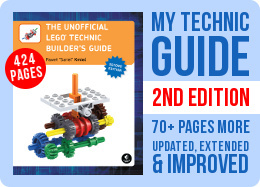 Great MOC and acing on originality! One mayor flaw which the Romans had figured out probably. Slavery! Their hamsters would never refuse to step in the treaadmill and do their jobs properly. Nowadays these generation Y rodents only do as they like for themselves, not taking into account the greater lego world that they are part of. 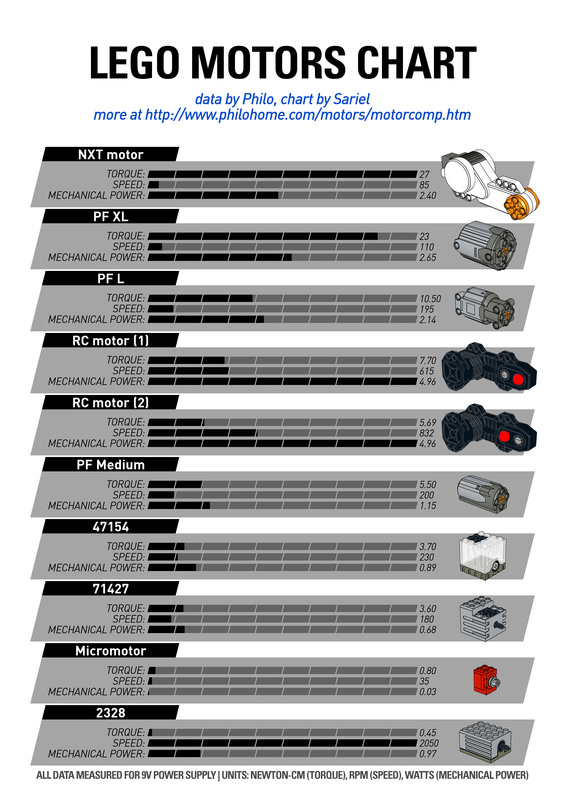 If only in the real (non lego) world this were to overcome via Power Functions…. Oh please… this song has been written before George Lucas was even born. Always interesting to come to this site every couple of days and see something new, nice work!